Feeding a Golden Retriever involves meeting different nutritional needs at various stages in their lives; such as during puppyhood, nursing mothers, when convalescing from illness and in older age. The Golden is a large breed of dog with a life span of 12 to 15 years. Golden Retriever nutrition requirements are extremely important and will change according to size and age. The Golden Retriever pup reaches its adulthood at the age of 12 months to 18 months and should then receive food suited or designed for adult Goldens. 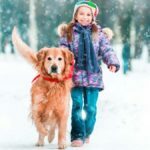 There is no recommendation here for a single type of Golden Retriever food as each dog is different but good quality food is essential for the health and well being of your pet. It is highly recommended to follow the prescribed amount of food indicated on the package instructions by the Retriever dog food manufacturer (or the recipe you are following). An active dog may require up to 500 calories a day more than a sedentary dog. The ideal dog food would be a ration that tastes like a postman. fCommercial Golden Retriever foods can be moist, semi moist or dry. 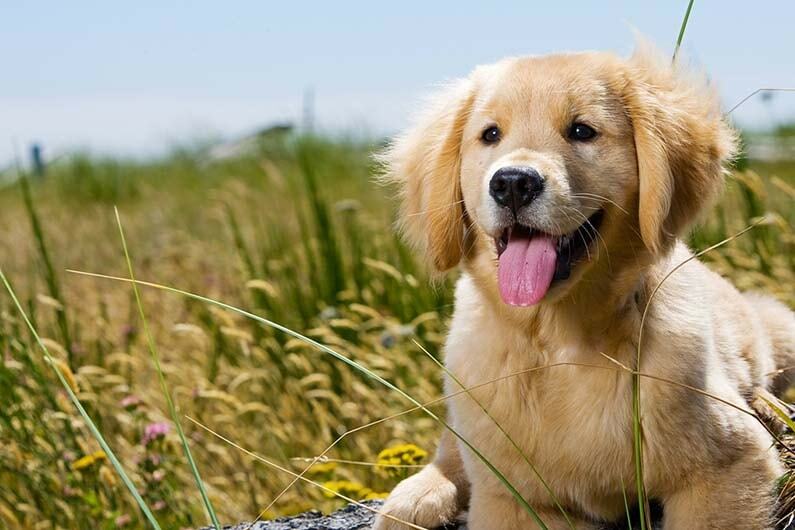 Goldens need several different quality animal proteins indicated by the words ‘meat, fish or poultry meal’. Dry foods (kibble) help to keep teeth and gums healthy but is a processed food. A high quality kibble should contain 25-30% protein but should not be the only food fed to your dog. Variety ensures that your Golden retriever dog food supplies all the nutrients required by your dog. Feeding a Golden Retriever with a natural home made diet can be time consuming and difficult to balance the nutrients. Before you commence a natural (or raw food) diet you should research this well and consult with your vet. The best diet for Golden Retrievers must still be supplemented with fresh foods such as raw ground beef, turkey, chicken, cottage cheese, yogurt and finely chopped/ processed vegetables. Feeding a Golden Retriever cheap food can make them prone to skin allergies and chronic infections related to a poor quality diet. Remember that cheap Retriever dog food will contain meat by-products, fillers, dairy, soy, eggs, corn, wheat, multiple cereals, artificial colors, flavors, and preservatives. These are all additives that can have a negative impact on your Golden’s health and exacerbate allergies and Golden Retriever shedding. 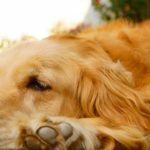 Some vets will advise against feeding a Golden Retriever with a bone as they can cause blockages in the digestive system. Cooked bones can splinter and injure your Golden, both in the mouth and internally. Choose bone type treats or chews made of hide, these will satisfy your dogs need to chew without the risks of a real bone. and forms the essential components of the blood, hormone and immune systems. Good quality proteins are recommended to be the top or main ingredient in Retriever dog food. 2. A small selection of healthy grains – brown rice, whole oats or barley. Carbohydrates are not an essential nutrient for dogs however, they can be useful in the diet as, when broken down during digestion, they become glucose and are used as energy. 3. Vitamins and minerals – ensures complete nutrition. 4. Vegetables and fruit – provide essential fiber for good digestion. 5. Healthy fats (such as omega 3) – fat is a major source of energy producing twice the calories of protein or carbohydrates. It helps the body absorb and transport certain vitamins and is essential for reproduction and pregnancy. Fat provides insulation and maintains skin health. It protects and waterproofs the coat hairs via sebum secretion. 6. Natural preservatives – many natural preservatives provide the fat soluble Vitamin E.
7. Prebiotics – can be helpful when it comes to healthy digestion. Read the package of Golden Retriever food; the ingredients will be listed according to weight. The top ingredient will also be the main ingredient in the Retriever dog food. You must provide plenty of fresh water to your Golden throughout the day. Avoid too many treats as Golden Retrievers are prone to gaining weight. A piece of kibble is fine to use as a treat when training your Golden. If your Golden Retriever gains too much weight from your feeding program, you can cut a few grams from its regular amount of food (1/4 of a cup at one or both meals) and encourage more exercise. Puppies need to eat frequently since they are fast growing and energetic. Feeding a Golden Retriever pup should occur at least three times a day on scheduled intervals, up to the age of 6 months. You should ask the advice of the Golden Retriever breeders or Golden Retriever adoption center from which you obtained your puppy and continue using the same Golden Retriever puppy food (at least initially). If you want to use a different food the transition should be gradual to avoid an upset tummy. Do not feed your puppy human food. Some foods such as chocolate are poisonous to dogs. Chews made of hide are especially important during the teething months, they will help to keep your Golden puppy’s teeth clean and keep his jaws in good condition. It is not recommended to leave food in your Golden puppy’s bowl. If your dog does not eat their food within 20 minutes, take it away until the next meal time. This practice establishes YOU as the pack leader, prevents obesity, and makes your Golden puppy easier to house train as they tend to relieve themselves after eating. A healthy Golden Retriever requires his or her owner to commit to providing the best care and good quality Retriever dog food! 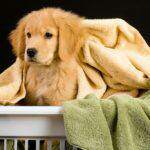 Feeding a Golden Retriever from puppy through to adulthood is a rewarding part of nurturing your dog.